Peter Sellers seems to be a bit of a forgotten actor today, I think. The only place it seems that I find anyone who really knows about him is online. Of course, those that do know of Sellers will be most familiar with his The Pink Panther films. And perhaps a few folks will remember any of his multiple roles in Dr. Strangelove, but certainly no one outside of my age range from where I live does. Well, maybe I'm selling a few people short on this and some people have just kept their love for good movies seriously hidden. If so then allow me to tell you that it is okay to like good movies and to be open about it. This is an age of acceptance, people. The bottom line is that more people should watch good movies and be willing to talk about them with the people they know. And saying, "I liked it" isn't exactly talking about it. That's a statement, not a conversation. Anyway, I'm off topic a bit. I'm going to talk about Being There, the greatest Peter Sellers movie you've probably never seen or heard about. Naturally, I have heard about it, watched it, and owned it because that's just how I roll. This film was the last film released before the death of Peter Sellers. If not for the posthumous release of The Fiendish Plot of Fu Manchu then this movie Being There would undoubtedly have to be the greatest of swan songs for any actor to go out on. But it's not, damn it. The story, much like the main character, is a very simple one. Chance is a gardener living on the estate of an old and dying millionaire. 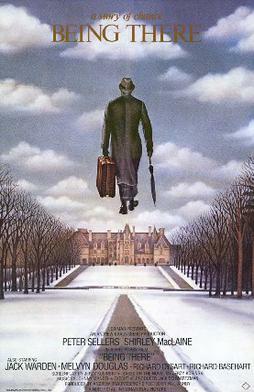 When the millionaire dies, Chance is forced to leave the estate and wander out into a world that he had previously only experienced through watching too much TV. Indeed, he had never left the estate before and does not know how to interact with people or drive a vehicle. So Chance the gardener walks along and soon finds himself in the presence of a man (Melvyn Douglas) who holds the ear of the President of the United States (Jack Warden). Somehow this simple man who knows only about gardening and television becomes quoted in newspapers and makes appearances on television by doing nothing more than... well, just being there. His simple words are constantly mistaken for deep metaphors by politicians and power brokers and it is no stretch to wander just who the real simpletons are. But Chance doesn't really care about politics or the economy. He doesn't even know what they are. He just wants to do some gardening and watch TV. This movie is very much a drama with a few comedic moments, but the funny parts are pretty damn funny. If you watch this film expecting to play a buffoon like Clouseau then you'll be disappointed. Chance is no buffoon. Simple, yes. Buffoon, no. Watch this movie. You'll like to watch. I'm glad you like this one. This is a favorite of mine and an unfortunately forgotten film. I'm kind of surprised this one is not a cult classic. I saw this in the theater when it came out and it was actually very popular when it came out. I remember I went to see this with a girl who hated it and wanted to leave. I thought it was great an absolutely refused to leave. I think that was our last date, I can not tolerate that kind of behavior XD. Actually that is the kind of response this movie gets, you either love it or you're a total loser moron who doesn't get it and you deserve to be dumped. I have seen this movie several times (I think I actually saw it twice in the theater because I had to go see it without being bitched at). The movie seems so simple and yet you can find a new twist in it every time you see it. SPOILER - What is your take on the end with him walking on the water. There are a ton of opinions on this and mine is very simple. He was able to walk on water because he didn't know that he couldn't. Everything was 2 dimensional to him. What do you think? That's certainly the most logical conclusion and the simplest. I kind of thought the same. It just fits in with everything else his character did. The whole movie had been about him sort of ending up achieving this level of fame without even knowing it. At the end when they discussing about him being president and I saw him walking on water... it kind of made perfect sense to me the next level of fame would have to be something near messianic.